Today I have the next four Tribal texture polishes from the Born Pretty Store swatched for you. The first four I did – a white, pink, gold, and green – can be found here. Just a note on the formula of these. I mentioned it in the previous post already, but these polishes are much slower-drying than other textures you may be used to. The dark blue I am showing today was particularly slow-drying. I mean, it could be dented for hours after application. Luckily this isn’t as noticeable with a textured polish but it’s definitely annoying, so I wouldn’t recommend using these when you’re in a hurry. The first one for today is a pale blue, Tribal texture number 14. Whoops, sorry for the strange lighting in that one! I still need to improve my lighting system for nail photos! 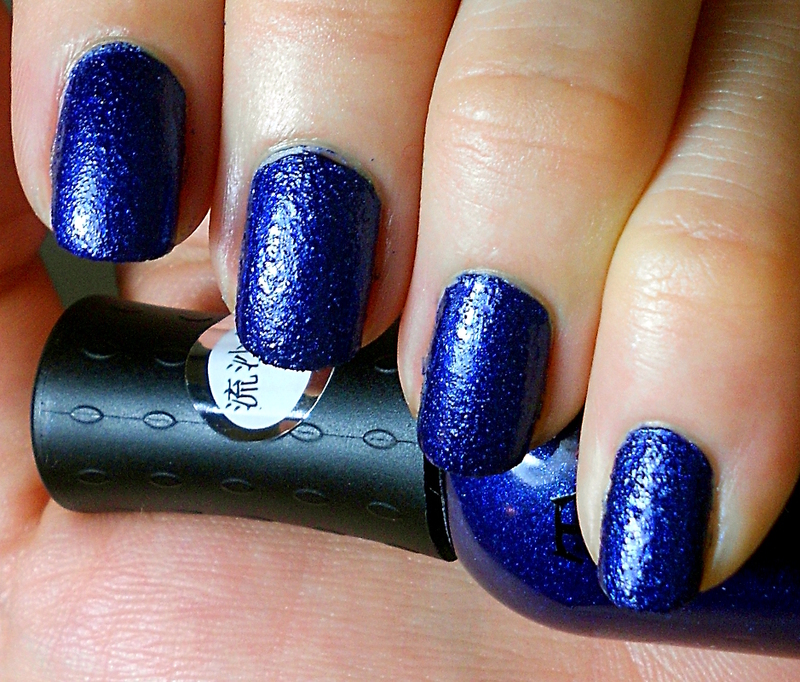 This is lighter than any other blue texture I have and while I tend to prefer the textures that have glitter in them, this one was shimmery and quite lovely – almost like frost on my nails. 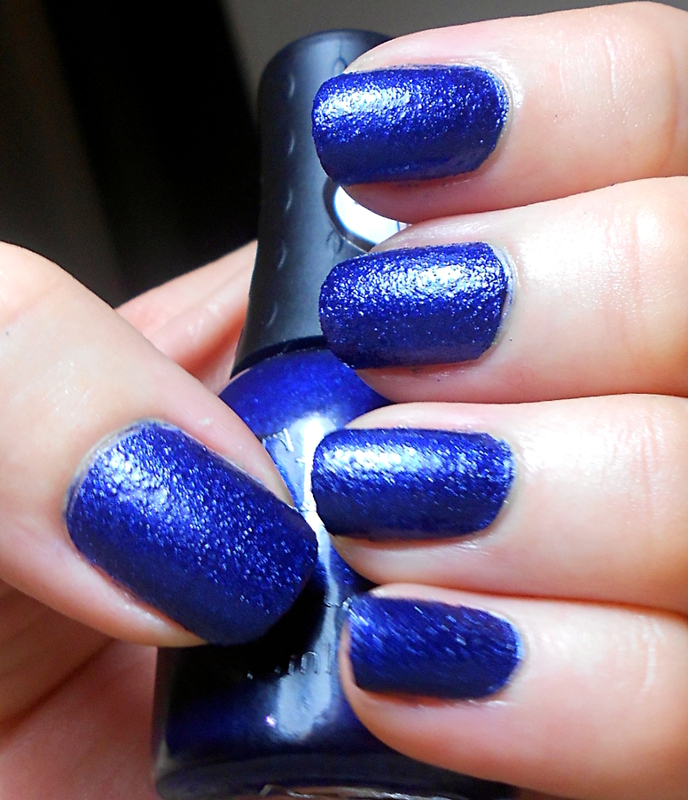 This seems like a perfect wintery shade to me so for those of you in the Northern hemisphere, now’s the time to get it! It’s worth noting that the texture on all of these is quite different to other textures I’ve used. It’s difficult to explain the difference but I think it’s easy enough to see in the pictures. 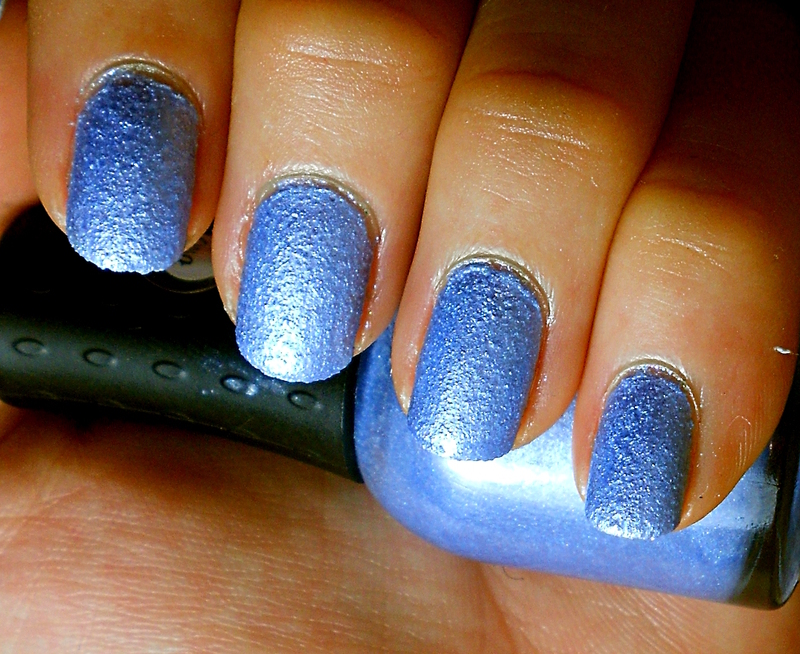 It’s as though other textures I have – like OPI liquid sands – are more gritty while these are more sort of wrinkly. That one was a winner for me! Next up is the dark blue, Tribal texture number 16. As I mentioned, the formula of this one left a lot to be desired. It took FOREVER to dry. 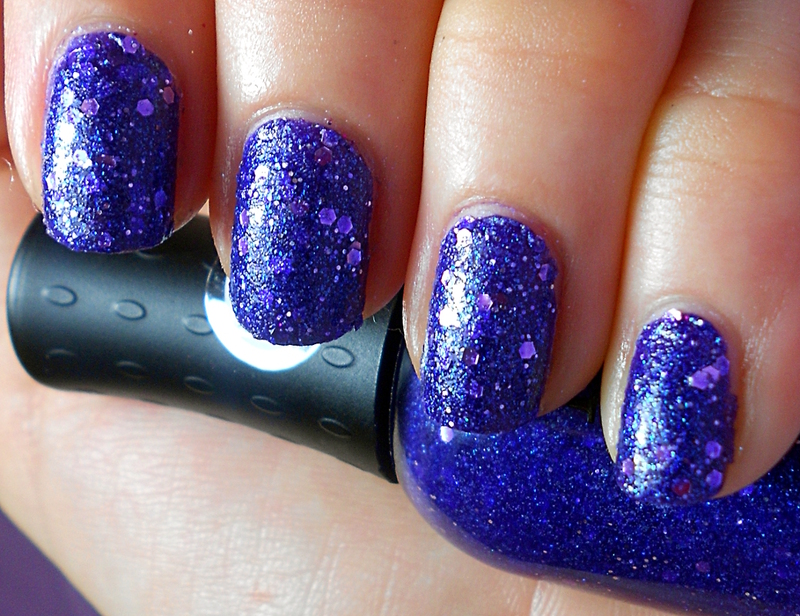 Usually I am a fan of dark polishes, but this one just didn’t speak to me – perhaps partially because of the formula issues. The texture isn’t as strong on this one, although it is still quite noticeable. Below I’ve shown it with top coat on the ring finger and thumb: In this case, I actually prefer the top coated version. 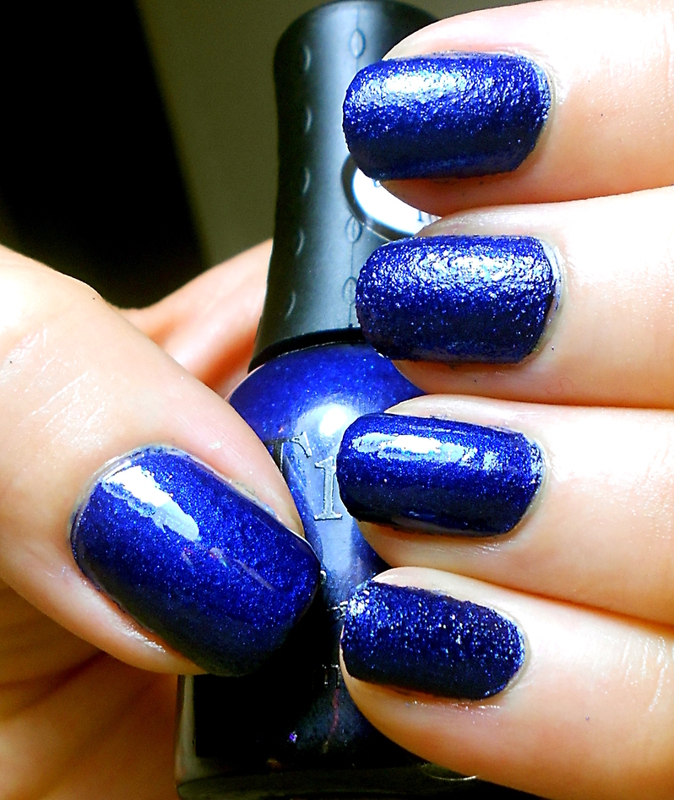 With top coat it brings out the gorgeous, rich, deep blue colour of the polish. In general I like my textured polish textured but this one I’ll definitely enjoy with a top coat. The third one for today is Tribal texture number 07, a purple. 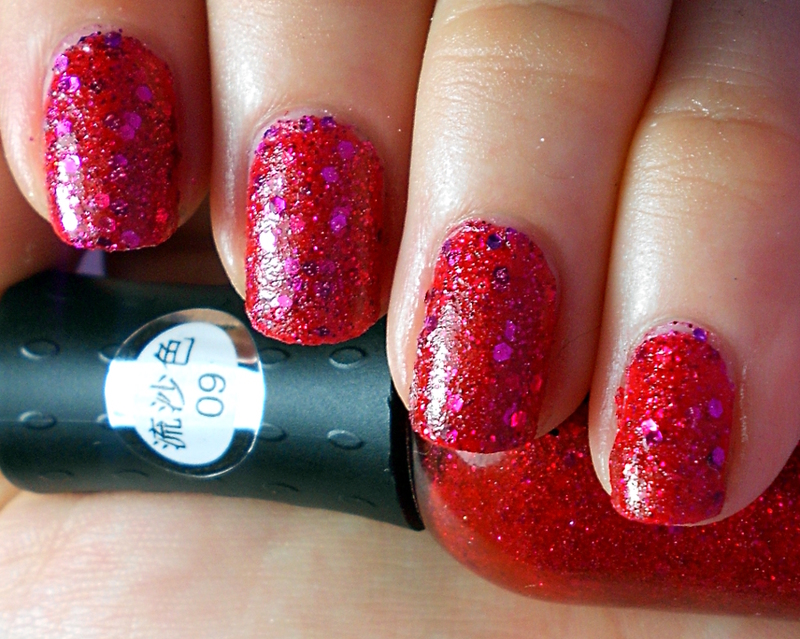 This is the first one I’m showing with large glitters. The glitter makes it a winner for me. I only have 2 in this type (this one and the red one shown below) but I feel like they’ve done a better job with these ones. Most of you probably know by now that I’m a purple lover so this one was destined to be a winner for me! In the picture below I’ve top coated my ring finger and thumb. I like the top coated version, but in this case I think I’d rather keep my texture! 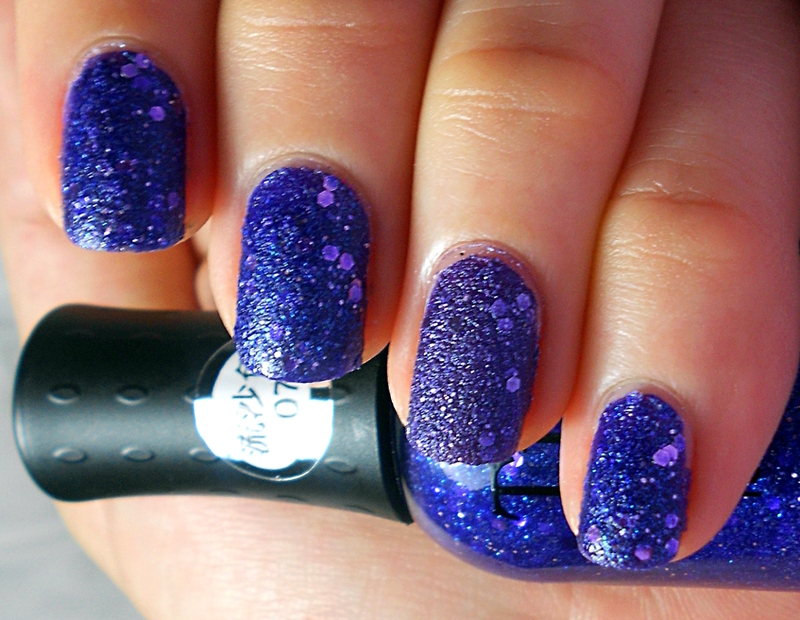 This looks pretty similar to OPI’s Can’t Let Go, so I did a comparison. Can’t Let Go is on my thumb and ring finger below. You can clearly see the difference between the two. Can’t Let Go has a finer, grittier texture and there is also a difference in colour – the Tribal texture has a slighter darker, more blue-based colour with lighter glitters suspended in it while Can’t Let Go has similar glitters but the base colour matches the glitters. I like both polishes, although the OPI naturally had a better formula and I prefer the nature of its texture. I really like the base colour of the Tribal texture though – and it is cheaper which is always something to keep in mind. The final one for today is a red, Tribal texture number 09. 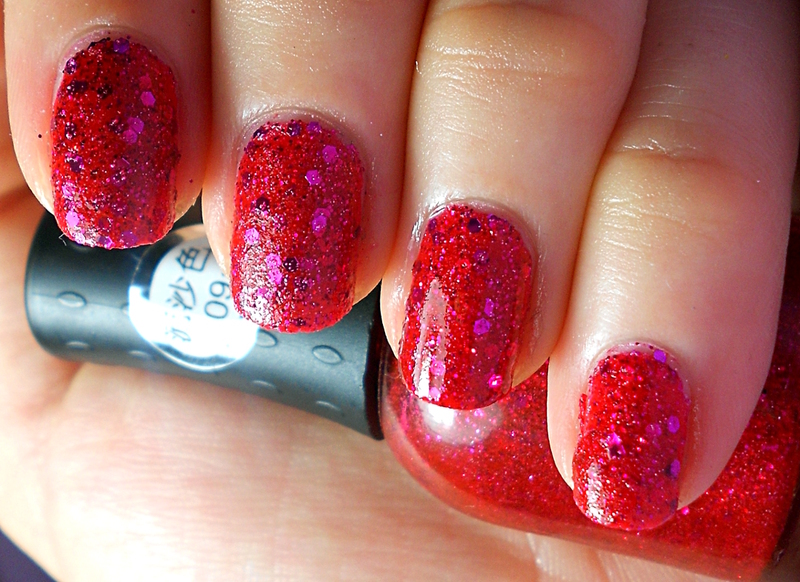 This was a red base filled with red and larger fuchsia glitters. The texture isn’t that strong, but the glitters help contribute to the textured look. This one was a winner for me. 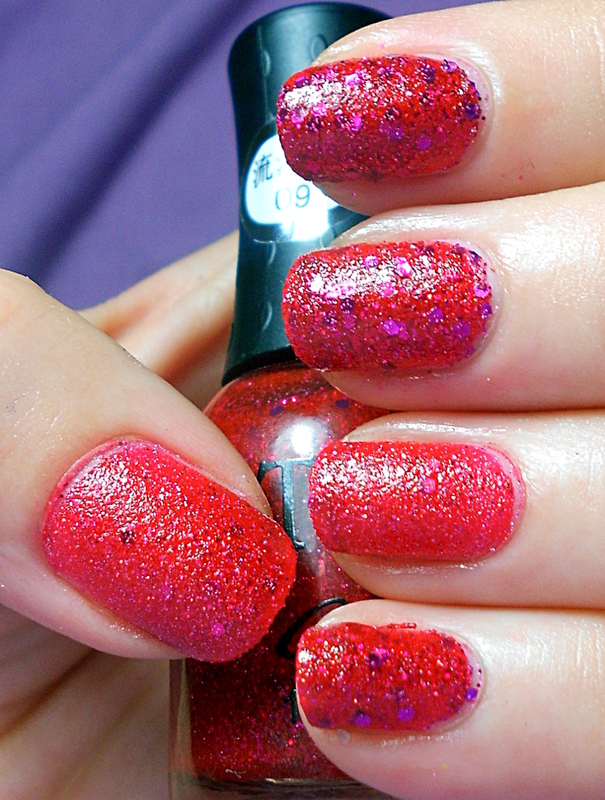 I liked the fuchsia glitters to break up the red a little – even though I love red sometimes I don’t like it on my nails but this made it work for me. 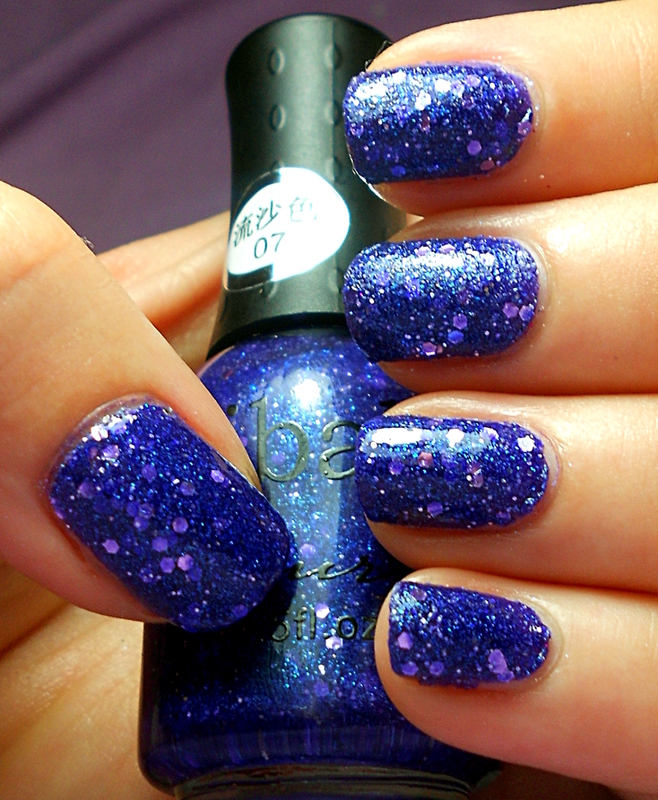 Below I’ve shown it with top coat on my thumb and ring finger. Honestly, I love it both ways. Sometimes I can’t decide if it’s better to have texture, or the added depth you get by putting a top coat over the texture. 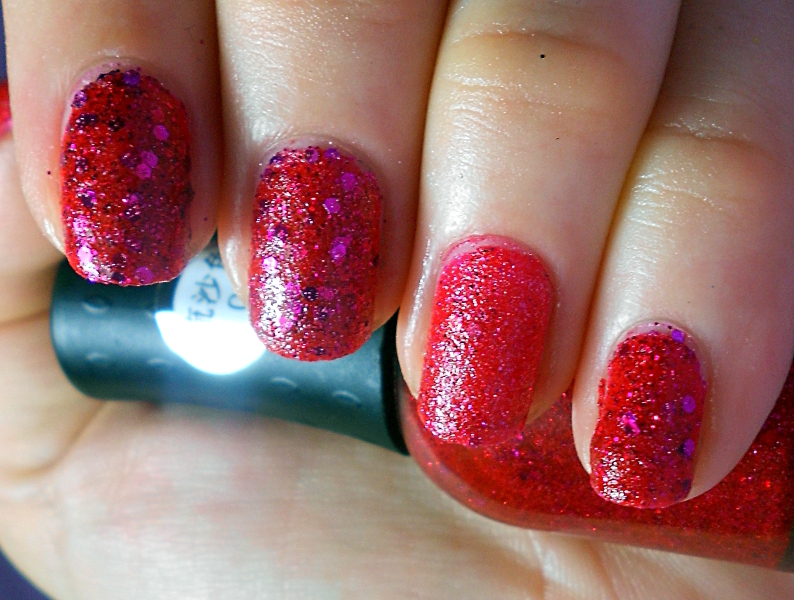 Since the base colour of this looked similar to OPI’s The Impossible, I did another comparison. The Impossible is on my ring finger and thumb in the pictures below. The difference is pretty clear between these. 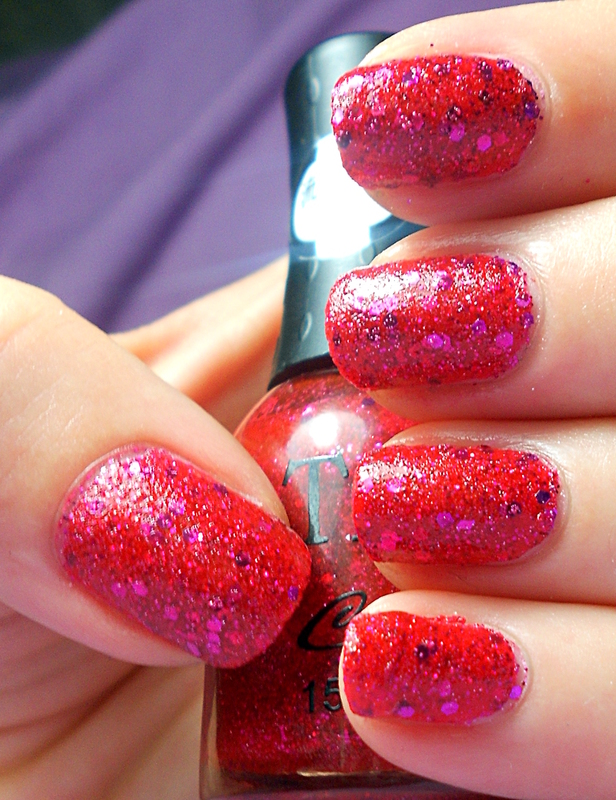 Even though the base colour is very similar, the Tribal texture seems to contain more glitter – especially the fuchsia glitter. The glitter in The Impossible is more similar to the base colour, so it blends in more. As usual, the OPI texture is also a little grittier. I do prefer the texture of The Impossible, but I am loving the fuchsia glitters in the Tribal texture! Are any of these Tribal textures speaking to you? The COLOUR of the dark blue one I like. Other than that, none are speaking to me. The wrinklyness of the texture reminds me of creased satin or silk. It looks like creasy satin to me. I love the frosty blue. Great for a Christmas mani or for snowflakes.